Michigan is composed of two separate peninsulas. Lake Michigan divides southern Michigan--the Lower Peninsula--from northern Michigan, or the Upper Peninsula. Northern Michigan lies in USDA Plant Hardiness Zones 3 to 5, with minimum winter temperatures between minus 10 and minus 40 degrees F. Easily-eroding and drought-damaged Kalkaska sand is the dominant soil in much of northern Michigan. The best flowers for this area will tolerate cool summers and--if they're perennials--sub-zero winters. Eastern red columbine (Aquilegia canadensis) is a buttercup family perennial completely at home in sandy, well-drained soil. Growing wild in northern Michigan's woodlands, it's a branching plant standing up to 2 feet tall. Delicate stems rise above lacy blue-green foliage, bearing nodding red-and-yellow blooms between February and July. The 2-inch long flower's spurred petals form nectar-filled tubes irresistible to hummingbirds and butterflies. These features make eastern red columbine a good choice for hummingbird and butterfly gardens. Plants, says the Lady Bird Johnson Wildflower Center, need partly shady to shady locations with sandy, moist, well-drained soil on the alkaline side (pH above 7). They will be evergreen in parts of northern Michigan where winter temperatures remain above minus 10 degrees F.
Forget-me-not (Myosotis sylvatica) is a perennial hardy throughout northern Michigan. Belonging to the borage family, forget-me-not is a low-growing spreading plant standing 5 inches to 1 foot high and up to 1 foot wide. Small light-blue, yellow or white-centered flowers nearly conceal its lancelike green leaves during April and May. Plants continue to bloom intermittently into midsummer. 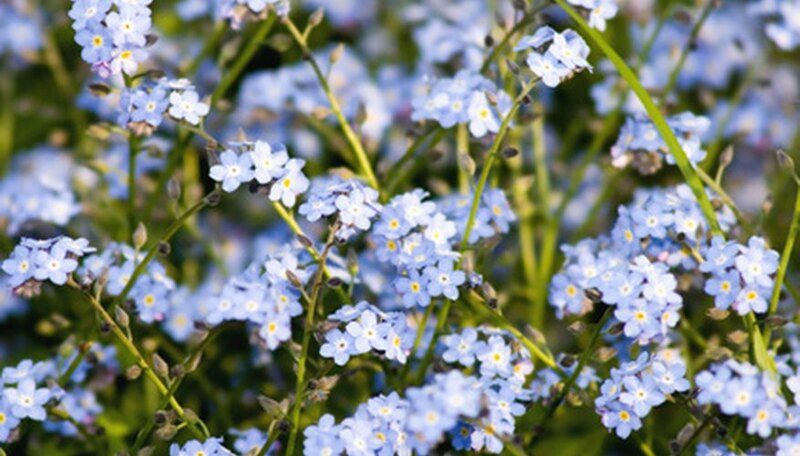 The Missouri Botanical Garden recommends using forget-me-not in rock gardens, as a bedding plant or around pond edges where it will be free to naturalize. It makes a charming addition to spring bulb gardens. Plant in full sun to partial shade and rich, moist, well-drained soil. Shear off the spent flower heads to prevent the plants from self-sowing, or they may become invasive. Everlasting pea (Lathyrus latifolius) is a tall, spreading--6 to 9 feet high and up to 6 feet wide--summer-blooming perennial. It survives northern Michigan's coldest winters and thrives in the cool summers. Everlasting pea's trailing habit, advises the Missouri Botanical Garden, works well in containers, on fences and other supports, or as a groundcover for rocky areas and slopes. Between June and September, plants have showy clusters of 1-inch white, rose pink or purple blooms between sets of lance-shaped blue-green leaves. Flat seedpods that follow the flowers are toxic if ingested. Plant everlasting pea in full sun and cool, humus-rich soil where it will have good air circulation. Keep evenly moist without wetting the leaves. Removing the seedpods will prevent self-sowing, but the plant also spreads by rhizomes.